Become a VIP (Vermont Invasive Patroller). Contact Janet (hjselby@surfglobal.net) or Peggy (peggyb321@gmail.com) to learn how. Septic Systems need regular attention; learn how to care for your septic system. Learn to recognize land based invasive species such as phragmites and Japanese knotweed. Volunteer to have your property evaluated by Lake Wise. Contact any water quality Committee member to learn how. Maintain a good mix of native trees, shrubs, herbaceous plants and duff on most of your lake shore. 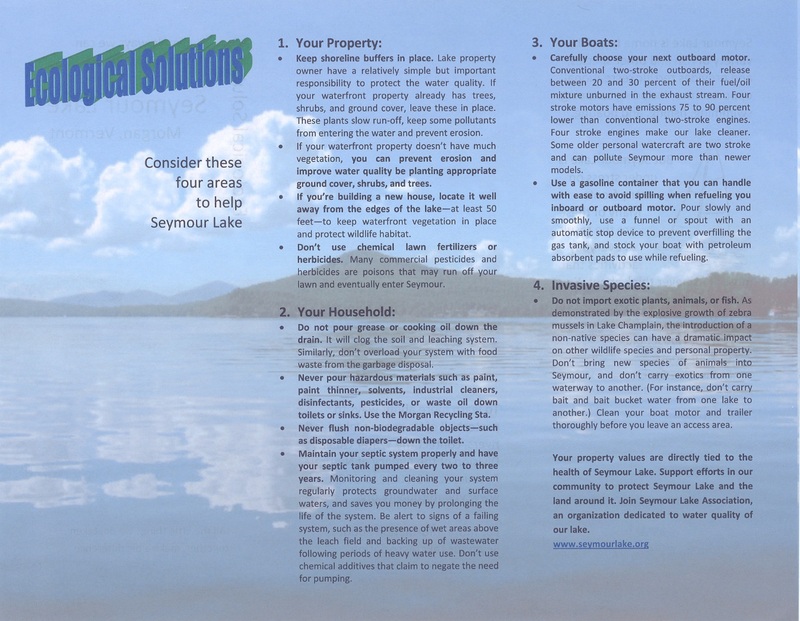 Ecological Solutions is a very simple but complete listing of what you can do to help Seymour Lake – see the information below.